Vicky is a highly experienced Sussex based hairdresser with over seven years experience in the industry. She has always had a natural flair for hairdressing and enjoys creating stylish hair ups in particular. For Vicky building relationships with clients is essential and she is passionate about and making her brides look and feel fantastic on their wedding day. She created a special bond with each and every bride, which starts at the wedding trial and carries on right up to the minute she walks down the aisle and beyond. 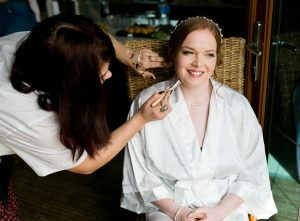 A key part of the process is creating great communication, working with the the bride, listening , getting to know her and creating a bespoke look unique to her for her wedding day. Vicky started her hairdressing career in a busy London salon but now works as a stylist in Brighton. She is fully mobile and more than happy to travel further afield than Sussex. She is keen to keep developing her skills and has completed several courses with Redken and Sergio Renis for Windle and Moodie. She feels her strengths lie in hair ups, plaiting and natural, wearable cuts and creating amazing colours. Although her passion is for bridal hairdressing, Vicky also enjoys designing amazing hairstyles for many other special occasions including f bat mitzvahs, bar mitzvahs, christenings, proms and birthdays .